For Mojan Payriz’s sister, President Donald Trump’s executive order banning travel from Iran could not have come at a worse time. But Friday afternoon Trump issued an executive order that banned Syrian refugees and barred travel from seven majority Muslim countries for 90 days, including Iran. By Saturday morning, Payriz learned that her sister’s interview with U.S. immigration officials — only a few weeks away — now was off. Payriz’s husband Christian Bennignus said that the orders are having a devastating effect on families like theirs. Trump’s order blocked permanent residents and valid visa holders — including students and employees — from entering the United States. 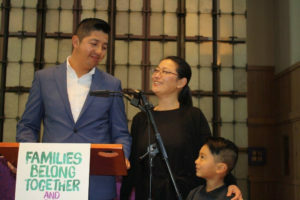 Many people were already were on their way to the United States when Trump signed the order, and were detained by U.S. Immigration and Customs Enforcement officials and faced deportation. 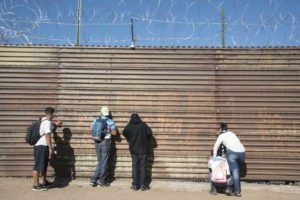 The ACLU told NBC News that about 200 people were detained or deported nationwide. 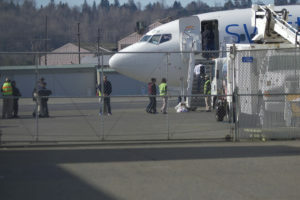 Citing the Port of Seattle officials, The Seattle Times reported that six travelers were detained at Sea-Tac. 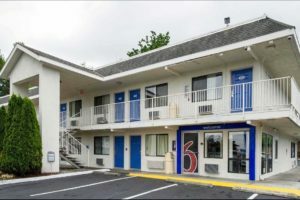 Two were allowed to enter, and four were going to be sent back, though U.S. District Court Judge Thomas Zilly issued a court order that stopped the departure of two of the four. 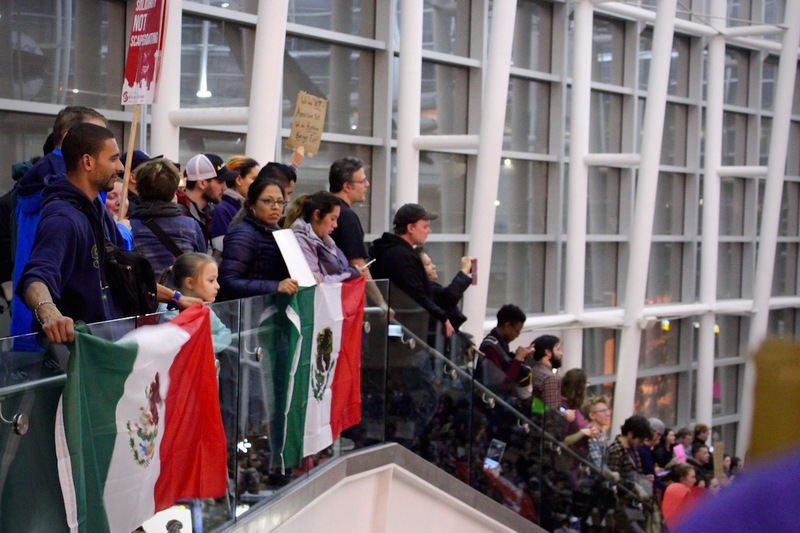 A federal judge in New York also issued an injunction against Trump’s order late Saturday, which halted the deportations. The countries affected by the 90-day travel ban are Iran, Iraq, Syria, Sudan, Libya, Yemen and Somalia. Several Washington state elected officials, including Gov. Jay Inslee, Lt. Gov. Cyrus Habib, Congresswomen Susan DelBene and Pramila Jayapal, Seattle Mayor Ed Murray and King County Executive Dow Constantine, held a press conference Saturday decrying the executive orders and demanding representation for the people detained at SeaTac airport. More than one official said the order recalled the incarceration of Japanese Americans after the bombing of Pearl Harbor — an order which resulted 40 years later in an apology from President Ronald Reagan and reparations to survivors of the camps. 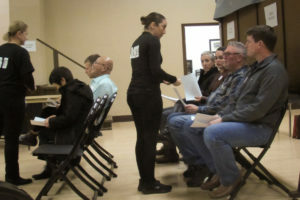 Habib said that the order affects many permanent residents, and prevents them from leaving the country because there is a risk they would not be allowed back in. “This would have been my family. Twenty-some years ago, my parents both came here from Iran in the 70s. Twenty-some years ago, my dad was still a permanent resident, green card holder. For example, if he decided on a Friday, like yesterday, to drive up to Vancouver to visit friends, he wouldn’t be able to come back and join us,” Habib said. Microsoft CEO Satya Nadella also issued a statement through LinkedIn, reporting that at least 76 employees have working visas and are citizens of the countries affected by the travel ban, but an unknown number have green cards. “As an immigrant and as a CEO, I’ve both experienced and seen the positive impact that immigration has on our company, for the country, and for the world. We will continue to advocate on this important topic,” he wrote. Thousands of people came to Seattle-Tacoma International Airport Saturday night to protest Trump’s executive orders to demand the release of the detainees. 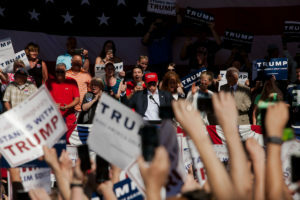 Reports on the number of attendees varied — KING 5 and KOMO TV put forward an estimate of 1,000 people, KUOW reported 3,000 and The Stranger reported 10,000. 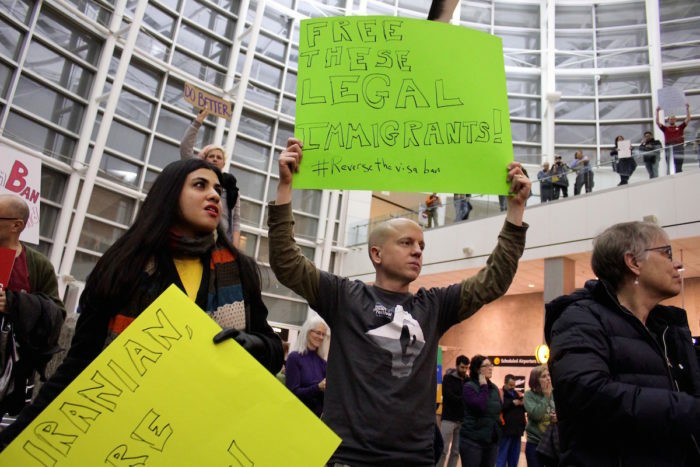 Chanting slogans including “No hatred, no fear, immigrants are welcome here” and “Hey hey, ho ho, Islamophobia has got to go,” the marchers crowded the international arrivals section of the airport and marched through the ticketing areas and near the screening areas through most of the evening. Michael Machain, of Seattle, marched while holding a Mexican flag in honor of his wife. “I’m supporting immigrants. For five years I’ve been married to my wife, and she’s been going to school, working, paying taxes,” he said. He said protesting Trump’s administration isn’t the end — he said he’d like to see a change of leadership to someone who understands immigrant issues and health care issues. 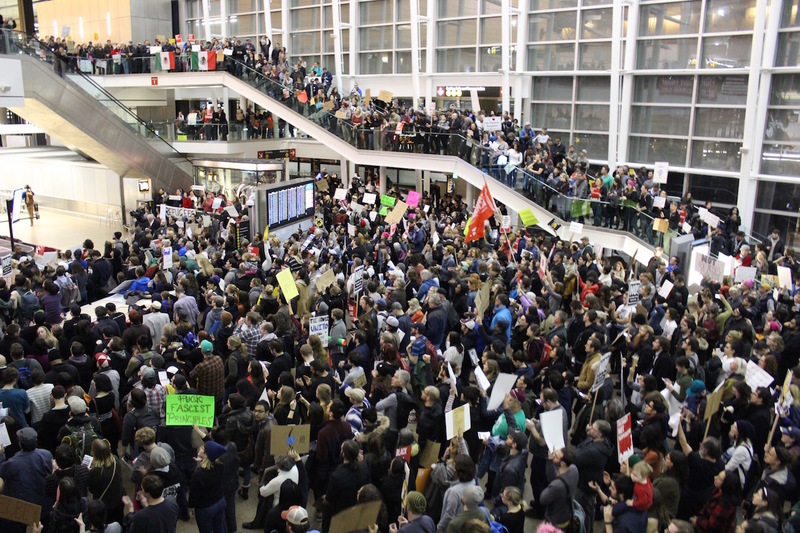 Machain said Trump’s campaign and victory activated him into action like the Sea-Tac protest. “We can’t stand by and let people stand for us, we’ve got to do that ourselves,” he said. In the early part of the protest, there were incidents between police and protesters were few, and many people brought children. But Sound Transit shut down the SeaTac Airport station briefly after the Port of Seattle made a request. The station was reopened less than a half hour later after complaints. But later in the evening, some of the protesters blocked entry gates, and police from different agencies including Seattle, Port of Seattle and other jurisdictions arrested some of the protesters. 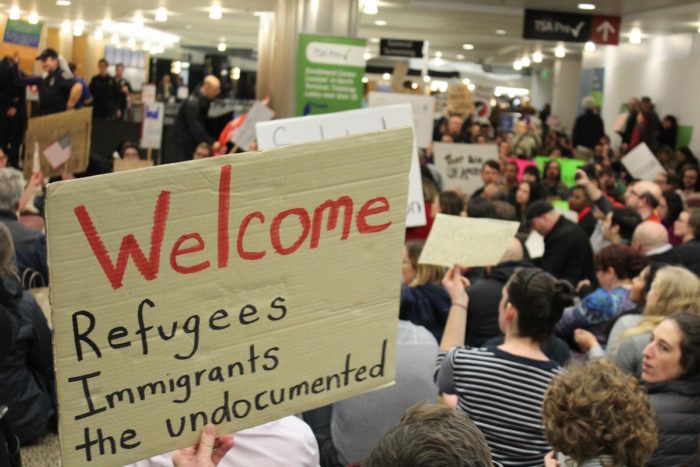 Tags: Donald J. Trump, Immigration, Muslim ban, Sea-Tac Airport, SeaTac, Seattle-Tacoma International Airport, travel, travel ban, Trump, visa. Hello, Venice, it’s Christian from the lead image in this piece. It was great meeting you and we very much appreciate your covering this regrettable issue. We are fired up and we’re not going way. What’s been forced on these legal immigrants is an absolute national disgrace. Please, we ask anyone to contact your Congresspeople, the White House, and to come march with us. This land is your land, this land is my land.